I saw the idea to paint with pine branches on The Artful Parent, and I thought it was a great toddler sensory paint project, and especially appropriate for the holiday. Certainly, the idea of painting with evergreens is not necessarily seasonal, but painting with Christmas tree branches is! Can't tell you how happy it makes me to create art with our Christmas tree! 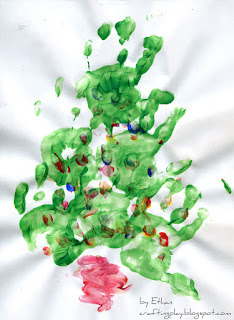 I put the paint on a paper plate pallet and suggested that Ethan dip the branches and then paint them on the paper. 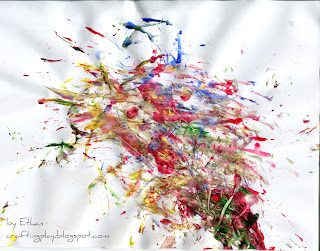 For children under a year old, I would suggest placing small blobs of paint on the paper first, and instead showing them to smear the paint around with the branch. As he was painting, we talked about how the branches were painting lots of little colored lines and dots on his paper. He really enjoyed himself, and I liked watching him explore. When we were all done, he had a really cool looking painting too! I love the feeling of motion and chaos that those fine smeary lines give it! Enjoy your holiday, and let me know if you're doing any crafting or art projects using your Christmas tree!! If the farm is going to be the centerpiece in our living room, it might as well be festive!!! Favorite is the wreath on the barn door and around the cow's neck! I found this idea on The Other White House via Pinterest and had to adapt it for Ethan this year! 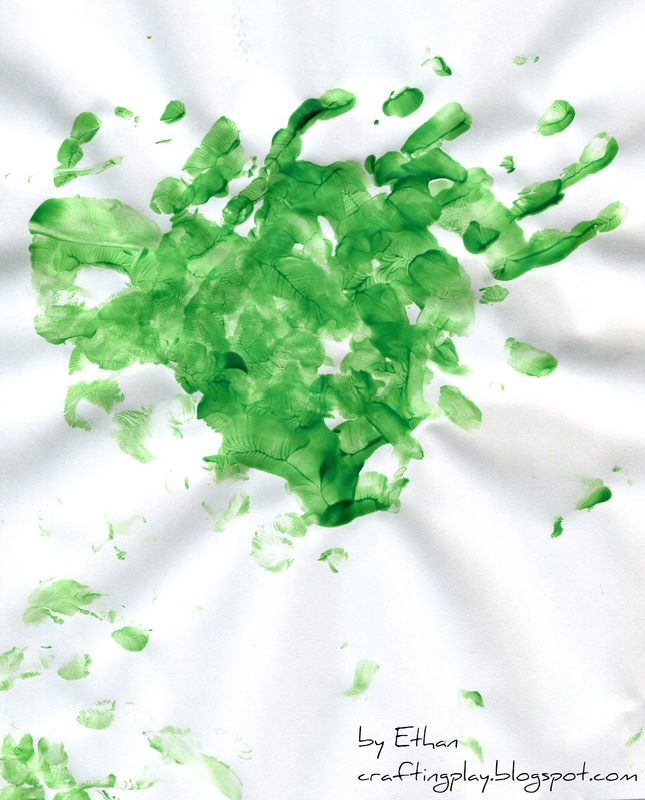 We used a paint on a pallet, putting a glob of green paint on a paper plate and smearing it around with Ethan's little hand before we "smack smack smacked" it down on the paper. (Saying "smack smack smack" makes it quite fun for your little person!) Since making the snowman handprint ornament, I've found the paper plate is really effective if you need to make a number of handprints! 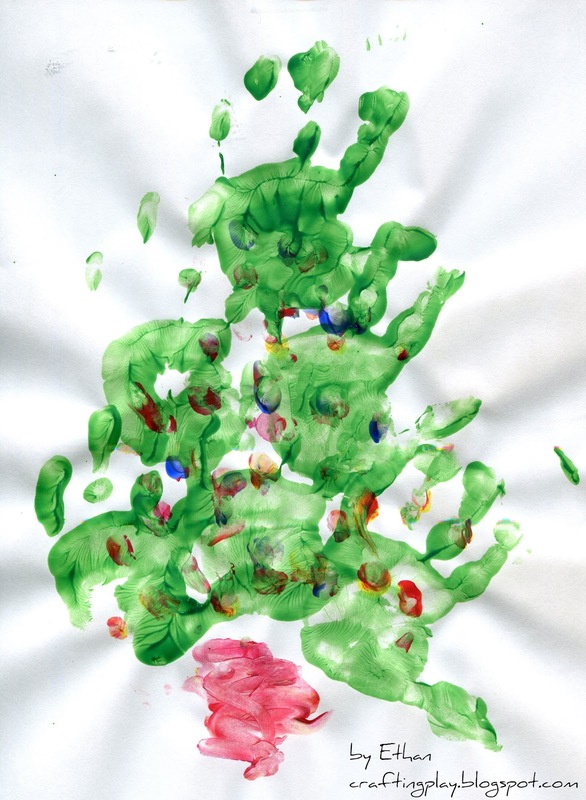 After we got the tree shape done, we used different colored paint on his fingertips to create the lights and then I helped him smear paint into a tree trunk.